Perky and powerful pop-punks Paramore are back on tour! Bringing their high-energy, raw show to DTE Energy Music Theatre on Friday 29th June 2018, the band are touring to promote their most recent offering, After Laughter, taking the audience on a journey from old school fan favorites to their more recent New Wave-inspired sound! 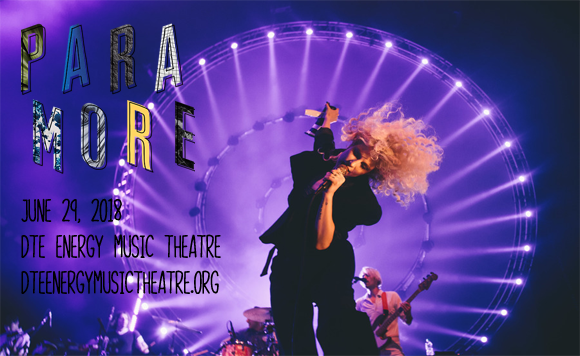 The Grammy Award-winners will be joined by Foster the People in support for this incredible show! Fronted by lead vocalist Hayley Willams and also comprised of drummer Zac Farro (who formed the band with Williams) and guitarist Taylor York (a high school friend of Farro and Williams, who joined the band in 2007), Paramore is an American rock band formed in 2004 in Franklin, Tennessee. The band released its debut album, All We Know Is Falling, in 2005 to moderate success, but it was 2007's follow-up album, Riot!, that caught the attention of a mainstream audience, launching the singles "Misery Business", "Crushcrushcrush" and "That's What You Get", and earning the band a Best New Artist nomination at the 2008 Grammy Awards. 2009's Brand New Eyes, the band's third studio album, was certified platinum in the UK and Ireland and gold in the US, Canada, Australia, and New Zealand, reaching number 2 on the Billboard 200 chart. Paramore released their self-titled fourth studio album in 2013, hitting the number one spot in the US, United Kingdom, Ireland, Australia, New Zealand, Brazil, Argentina and Mexico. The album launched the Grammy Award-winning single “Ain't It Fun”. Their latest record, After Laughter, was released in 2017.